Mozir was one of six volunteers whose community work has been deemed a “shining example of unselfish giving” have been honoured at the borough’s annual Civic Awards. Several hundred guests gathered in Wandsworth’s Civic Suite on November 28 to applaud the award winners, who regularly give up their time to help others. When Mozir Uddin Ahmed (pictured above with Mayor Knowles) moved to England in 1966, he spoke little English. 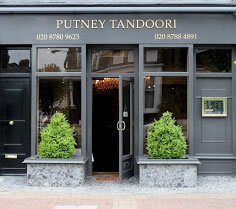 In 1988, he settled in Wandsworth where he opened “the Standard” – one of the first restaurants in the country to serve traditional Bangladeshi cuisine – before launching the Putney Tandoori. Over the past 25 years he has conquered the language barrier – and recovered from a heart attack and triple-bypass operation – to establish himself as a well-respected community volunteer. Mozir has been financially supporting local children’s sports teams for nearly a quarter of a century through a community programme – including children’s 7 a-side football team Mango Putney. 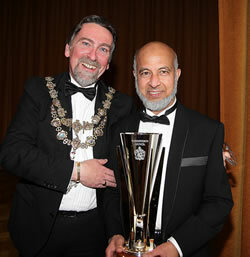 He has also been an advocate for local businesses, promoted inter-faith cooperation and helped to raise £10,000 in donations for flood victims in Bangladesh. Presenting them with their awards, Mayor of Wandsworth, Councillor Adrian Knowles, admitted to being “humbled” by the amount of work the six men and women have done for Wandsworth’s community – without expecting anything in return. Aside from the six Civic Award winners, the event featured another success story in the form of a charity collection, which raised £1,460 for the mayor’s chosen charities - Oak Lodge School for deaf children and The Royal Marsden Hospital.